The Port Gamble S’Klallam Tribe has received $617,000 in federal grants to investigate toxic pollution around Port Gamble Bay — including the reservation, mill site and possibly other private properties where owners wish to know if they have a problem. In a story I wrote for today’s Kitsap Sun, I reported on the study process, which includes hiring a consultant as early as this week. Going forward methodically, the effort could finally determine how many sites need major cleanup, how many can be handled with some minor soil removal and how many need no attention at all. Portions of the mill site and the bottom of the bay in places are expected to require significant work. In an agreed order signed between Pope Resources and the Washington Department of Ecology, pollution is being studied around the mill site and offshore. A report on that work is expected to come out soon. I’m not sure how all this will play out. There’s an ongoing tension between Pope Resources and the Port Gamble S’Klallam Tribe. The company would like to redevelop the old mill site and other properties nearby. The tribe is committed to low-key activities, including fishing and shellfishing. 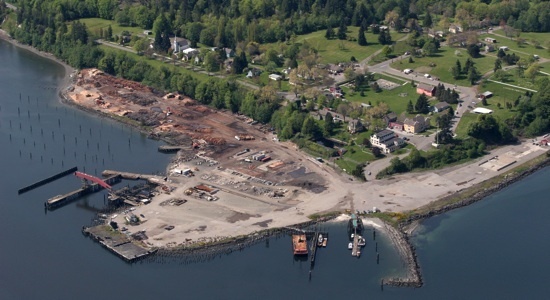 In 2008, at the insistence of the tribe, the Washington Department of Ecology revoked a permit for a 165-foot dock the company wanted to build for future tourism operations. (Check out the Kitsap Sun story July 31, 2008.) The tribe worries that a commercial dock will harm herring-spawning areas and force closure of valuable shellfish beds. As the showdown loomed over the dock, I discussed the stark differences in attitude between the company and the tribe in a Water Ways post on June 5, 2008. To complicate matters more, Port Gamble is at the center of a plan that would set aside 7,000 acres Pope Resources forestland forever. In terms of protecting forest habitat, that would be a profound achievement. Of course, the company will do that only if it gets another way to earn income on its investment. The idea — with initial buy-in from County Commissioner Steve Bauer — is to greatly expand the community near Port Gamble Bay. For more information about that plan, see a story that Brynn Grimley and I wrote for the Kitsap Sun on Jan. 19. A Water Ways entry two days later discusses the challenge of putting this idea together. It includes links to four stories and an editorial on the topic. No matter what destiny is in store for Port Gamble, the search for contamination could provide important scientific information. Whether the study will be used for political gain is another question.